Seaspan Corporation ("Seaspan") (NYSE: SSW) announced that it has partially prepaid two credit facilities. 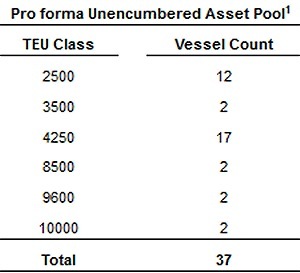 Upon completion of all collateral release documentation, this will expand Seaspan's pool of unencumbered vessels to 371, from 32 as reported in its press release dated January 16, 2019. Ryan Courson, Chief Financial Officer of Seaspan, commented, "We continue to execute on our near-term capital strategy to strengthen our balance sheet by deleveraging, increasing our unencumbered fleet, and consolidating our secured credit facilities." (1) Includes vessels securing debt prepaid on March 25, 2019, and for which collateral release documentation is pending.